Banner Advertizing is one of the most cost effective forms of advertizing available today. A good banner ad should be low cost, highly targeted and seen by potential customers that are already interested in products or services in your market. Is DieselEngineTrader.com the correct site for my Banner Ad? DieselEngineTrader.com is visited extensively by decision makers in the Marine, Industrial, Off Highway and Automotive diesel engine markets. These decision makers are buying, selling and servicing diesel engines and spare parts. 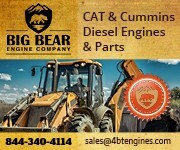 If this is your target market then DieselEngineTrader.com is the right site for your Banner Advert. What types of Banner Ad are offered? There are two types of banner on offer, a fixed banner on the right hand side of all pages and a rotating banner which appears on most pages throughout the website. Your fixed home page banner will always appear on the right hand side of all pages but in a different position each time. One (sometimes two) rotating banner will appear on nearly every page on the website and will be selected at random so your rotating banner will appear about every 4-6 pages. Look at the top of this page for an example of a rotating banner. As fixed banners obviously get significantly more exposure, they are more expensive that rotating banners. What do I get for this money? With over 200,000 visitors each month to DieselEngineTrader.com, your banner advert will be seen by many thousands of potential customers. A fixed banner will get more exposure than rotating banner and also tend to get better click through rates as they appear on the home page. They are therefore more expensive. How many times a month will my advertizement be shown? At the current visitor numbers, your rotating banner advert would be shown approximately 100,000 times a month. That's 100,000 potential customers seeing your message for as little as US$50.00 per month. Now that's real value for money!! We keep a record on the number of times your advert is shown and the number of times someone clicks on the advert. This information is available to you at all times. Combine this with the tracking that you have on your own website and you will get a good idea of how much traffic your banner advert is generating. What are the requirements for the banner advert? Your banner advert must be either 180x150 pixel for fixed home page ads or 728x90 pixel for rotating ads. All ads must be GIF images and must be static for home page ads but can be either static or animated for rotating ads. If you do not already have an advert then we can produce one for you at an additional cost. 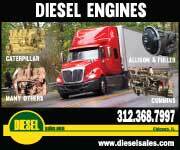 Email info@dieselenginetrader.com with Banner Ad in subject line and include your phone number and one of our team will contact you.